It’s not necessarily the monsters that will kill you. Like with any game of any genre, roguelikes come in all shapes and sizes and a variety of them can be enjoyed on the Nintendo Switch, including the recently released Crimson Keep. Designed, created and developed by Ian Atherton and Ben Rog-Wilhelm, Crimson is defined as being a “first-person action RPG,” which with the help from Merge Games, was brought to the likes of Switch and Steam last month. As for its premise, it’s rather simple really. After a dreaded cursed destroyed the village of Larkstead thirty years previously, the player is banished to dwell in the dungeons below the village and survive by any means necessary, should they wish to discover the mysterious Crimson Keep, claim a formidable power as their own, and escape alive. Where things get tricky, is not in the fact that there are monsters, beasts, terrors and traps waiting for you at every turn, but in the game itself. 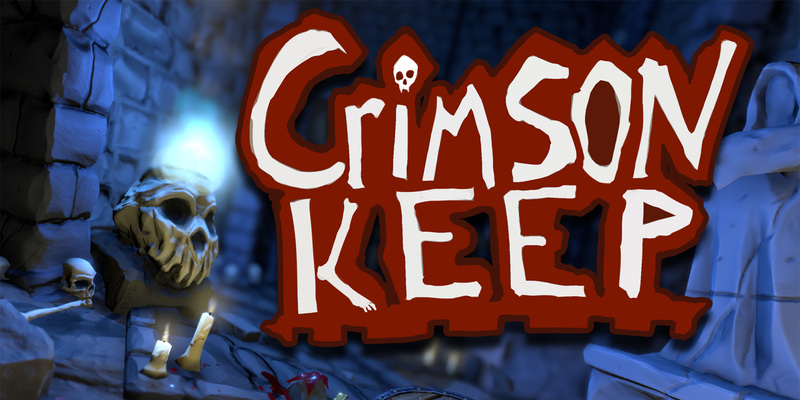 Being a roguelike, Crimson Keep has randomised content, which affects dungeon layouts, enemies, shrines, traps and even the types of weapons, scrolls, armour and potions you pick up. All it takes is one good run where you pick up everything you could possibly need to deal ultimate damage to your foes and be able to take your fair share of hits, but in my case, luck just never wanted to be on my side. Instead of a fast swinging sword, I’d get a sluggish axe. Yeah, it would hurt whomever and whatever I hit, but when they were hitting me from a distance thanks to spells hurled at me, it makes things a tad harder. Saying that the gear system of Crimson Keep is one of its highlights. They have a range of beneficial features to better your chances of survival, but they can also be cursed and you’ll need to hunt down food as hunger is a factor you need to be aware of. You will also require mana (displayed as a bar above the said buttons above.) Use too much mana and you will run out of it, but it can be replenished by killing enemies. Still, you can always save consuming mana for the really tough enemies by resorting to the likes of using ZR and ZL to attack (be it with a sword or a wand,) and press B for the occasional job. As for the directional buttons, they’re used for using items you have in your belt, such as recovery items and the left analog stick, it should come as no surprise but it’s for moving. Now on top of being a game where everything can vary with every playthrough, so can the character you play as. Drifter draws the short stick however since he or she, is the weakest of the bunch and has even less chance of coming out of the other side, smelling of roses, (getting out alive.) Still, while Crimson Keep has some nice ideas behind it, it also has a lot of issues throughout. Gameplay is meant to be engaging, fast and addictive and yet despite the first-person perspective being intended to have the player feel more immersed into experience, to me it just felt dreary and that’s not my only negative. The voice acting in Crimson Keep comes across as being hollow and disinterested, the controls themselves feel cumbersome and the visual style of the game just did nothing for me. The models of the monsters are fine, but the players hands just looked obscenely bad and the lack of an arm connected to each hand, just really took my out of the experience, every time I looked out them and I looked at them a lot. So, although it pains me to say this, Crimson Keep has done enough to warrant attention, but not the right attention because in its current state, it’s a roguelike that does not justify picking up in its current state. While Crimson Keep does live up to its roguelike nature, in the end, the few things it did right, are undone by what it got wrong. It is not as engaging and as immersive as its summary makes it out to be and this is one of those cases where the developers should have put a little more time into it, whilst administering some more spit and polish before hastening it out the door and getting it into the hands of gamers.